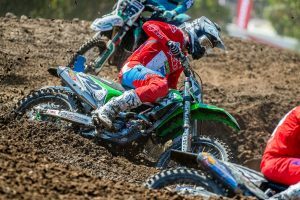 Post-race updates from the MX1 and MX2 classes at round five of the 2018 Pirelli MX Nationals, direct from Murray Bridge in South Australia. Defending national MX2 champion Egan Mastin put forward a commanding performance in the opening Pirelli MX2 moto of the round, launching to the hole-shot and controlling the moto from there. Mastin picked up his first race win of the season since joining KTM Motocross Racing Team and switching to the 250 SX-F, extending his advantage to 9.172s during the 30-minute plus one lap encounter. Behind the number one, current points leader Wilson Todd (Serco Yamaha) rode a controlled race for second, holding Kyle Webster (Penrite Pirelli CRF Honda Racing) at bay, as top qualifier Hamish Harwood (Davey Motorsports KTM) and Dylan Wills (DPH Motorsport Husqvarna) filled the top five. It was a strong result for privateer Kale Makeham (Yamaha) in P6, narrowly ahead of rookie Jy Roberts (Husqvarna), with Jayden Rykers (Raceline Pirelli KTM), Joel Evans (Husqvarna) and Aaron Tanti (Complete Parts Kawasaki Racing Team) 10th. Disaster struck Yamalube Yamaha Racing’s Jay Wilson in the early laps, his YZ250F coming to a halt and forcing him out of the moto. 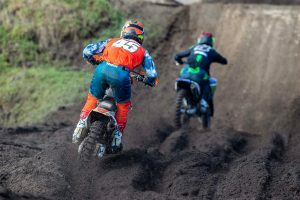 It was a battle royale in the opening Thor MX1 moto as KTM Motocross Racing Team’s Luke Clout stormed to the lead out of the gates and led the first 25 minutes. Coming under all kinds of pressure from dominant defending champion Dean Ferris (CDR Yamaha Monster Energy Team) – who worked his way forward from outside the top five – it was a defining ride from Clout, who tried to best to retaliate when Ferris made his way by in the closing minutes. 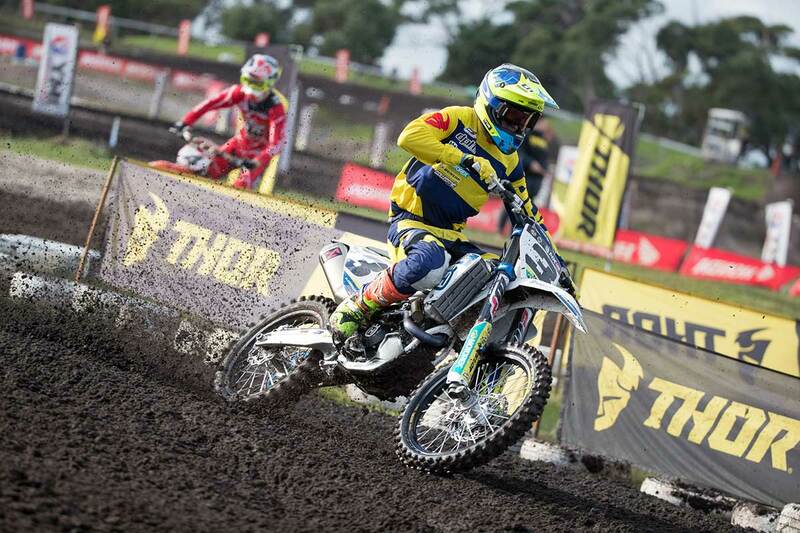 From there Ferris went on to win by 5.662s, ahead of Clout and his teammate Kirk Gibbs (KTM Motocross Racing Team), the Super Pole winner who had to throw his goggles in the race’s second half. Another South Australian in Brett Metcalfe (Penrite Honda Racing) was fourth across the line, two seconds in arrears of Clout, while Kiwi Rhys Carter (Complete Parts Kawasaki Racing) pressed through to fifth. In sixth and seventh came rookie duo Mitch Evans (Raceline Pirelli KTM) and Caleb Ward (Davey Motorsports Husqvarna), with a fast-starting Dylan Long (CDR Yamaha Monster Energy Team), Kade Mosig (DPH Motorsport Husqvarna) and top independent Connor Tierney (Yamaha) closing out the top 10. The second MX2 moto was dominated by class newcomer Roberts, making full use of his hole-shot to remain composed out front and that’s where he remained. Roberts showed maturity beyond his experience to lead from the front, eventually crossing the finish 7.126s ahead of last year’s Murray Bridge victor Harwood, with Todd rounding out the podium in another consistent effort. Usual suspects Webster and Tanti were fourth and fifth respectively, with Wilson rebounding from his race one DNF to capture sixth this time out, ahead of Wills, Makeham, Kaleb Barham (Mladin Racing Husqvarna) and Isaac Fergusson (KTM). In 11th was moto one winner Mastin, forced to recover from a first turn fall, but bumping himself out of contention for the overall podium. Instead it was Todd who extended his championship lead with the overall, ahead of Harwood and Roberts in what was a breakthrough result in his pro career. 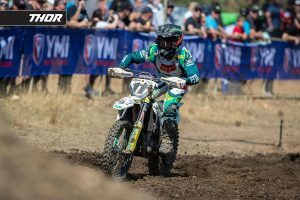 Moto two of the premier class has resulted in the perfect run of Ferris to date this season coming to an end, as Mosig delivered his first victory of the year aboard the DPH-prepared FC 450. After getting out front from the outset, Mosig was able to keep the number one plate-holder at bay by 1.713s at the conclusion of the 30 minutes, with Gibbs rounding out the top three, albeit near 20 seconds in arrears of the leaders at the head of the field. Fourth was a stronger ride from Long this time out, followed directly by Ward, as Metcalfe, Clout after a more difficult start this time out, Evans, Carter and Tierney completed the top 10. Overall for the round it was Ferris who still managed to make it five from five overall in 2018, trailed by the ever-consistent Gibbs and Mosig, who made it consecutive round podiums on his behalf heading into the annual mid-season break.